Anderson, P.C. (ed.). 1992. Préhistoire de l’agriculture nouvelles approches experimentales et ethnographiques. (20 of the 28 papers in this volume are in English). Paris: Editions du CNRS. Monographie du Centre de Recherches Archéologiques fi. Bender, B. 1978. Gatherer-hunter to farmer: a social perspective, World Archaeology 10: 204–22. Binford, L.R. 1968. Post-Pleistocene adaptations, in Binford, S.R. &#x0026;Binford, L.R. (ed. ), New perspectives in archeology: 313–41. Chicago: Aldine. Braidwood, R.J. &#x0026; Braidwood, L. 1950. Jarmo: a village of early farmers in Iraq, Antiquity 24: 189–95. Childe, V.G. 1928. Tlie most ancient East: the oriental prelude to European prehistory. London: Kegan Paul, Trench, Trubner. Darwin, C. 1868. The variation of animals and plants under domesticotion 1. London: John Murray. De Candolle, A. 1882. Origine desplantes cultivées. Paris: Germer Baillière. Flannery, K.V. 1968. Archeological systems theory and early Mesoamerica, in Meggers, B.J. (ed. ), Anthropological archeology in the Americas: 67–87. Washington (DC): Anthropological Society of Washington. Flannery, K.V. 1973. The origins of agriculture, Annual Review of Antliropology 2: 271–310. Ford, R.I. 1985. The processes of plant food production in prehistoric North America, in Ford, R.I. (ed. ), Prehistoric food production in North America: 1–18. Ann Arbor (MI): University of Michigan Museum of Anthropology. Anthropological Paper 75. Hahn, E. 1896. Die Haustiere und ihre Beziehungen zur Wirtschuft des Menschen. Leipzig: Duncker &#x0026; Humblot. Harris, D.R. 1969. Agricultural systems, ecosystems and the origins of agriculture, in Ucko, P.J. &#x0026; Dimbleby, G.W. (ed. ), The domestication and exploitation of plants and animals: 3–15. London: Duckworth. Harris, D.R. 1981. Breaking ground: agricultural origins and archaeological explanations, Bulletin ofthe Institute of Archaeology, University of London 18: 1–20. Harris, D.R. 1990. Vavilov’s concept of centres of origin of cultivated plants: its genesis and its influence on the study of agricultural origins, Biological Journal of the Linnean Society 39: 7–16. Higgs, E.S. &#x0026; Jarman, M.R. 1969. 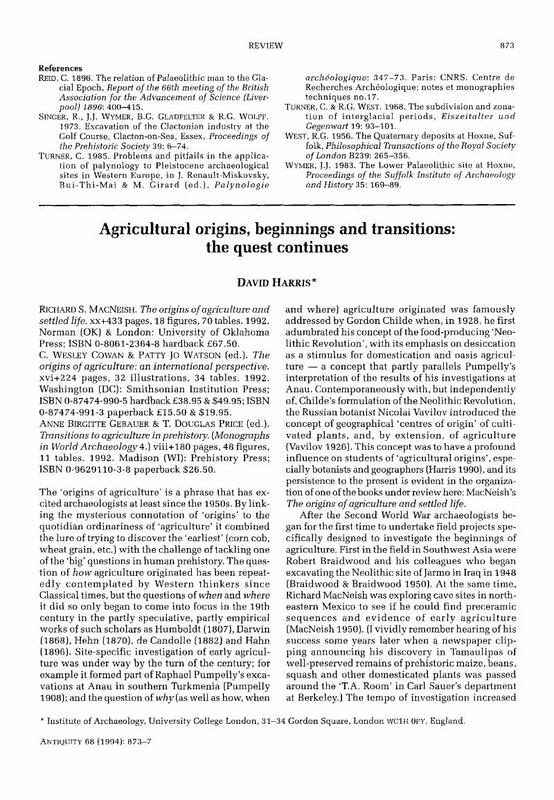 The origins of agriculture: a reconsideration, Antiquity 43: 31–41. Humboldt, A. VON 1807. Essai sur la géographie des plontes. London: Society for the Bibliography of Natural History. Facsimile published in 1959. Hynes, R.A. &#x0026; Chase, A.K. 1982. Plants, sites and domiculture: Aboriginal influence upon plant communities in Cape York Peninsula, Archneology in Oceania 17: 38–50. Jarman, M.R., Bailey, G.N. &#x0026; Jarman, H.N. (ed.) 1982. Early European agriculture: its foundations and development. Cambridge: Cambridge University Press. Kenyon, K.M. 1960. Jericho and the origins of agriculture, The Advancement of Science 66: 118–20. Macneish, R.S. 1950. A synopsis of the archaeological sequence in the Sierra de Tamaulipas, Revista México de Instituto Antropología 11: 79–96. Macneish, R.S. 1972. The evolution of community patterns in the Tehuacán Valley of Mexico and speculations about cultural process, in Ucko, P.J. Tringham, R. &#x0026; Dimbleby, G.W. (ed. ), Man, settlement cind urhunism: 67–93. London: Duckworth. Mellaart, J. 1958. Excavations at Haqilar: first preliminary report, Anotolian Studies 8: 127–56. Mellaart, J. 1962. Excavations at &#x00C7;atal Hüyük, Anatolian Studies 12: 41–65. Pumpelly, R. (ed.). 1908. Explorations in Turkestnn: cxpcdition of 1904: prehistoric civilizations of Anau. Washington (DC): Carnegie Institution of Washington. Reed, C.A. (ed.). 1977. Origins of agriculture. The Hague &#x0026; Paris: Mouton. Rindos, D. 1984. The origins of agriculture: an evolutionary perspective. Orlando (FL) &#x0026; London: Academic Press. Vavilov, N.I. 1926. Studies on the origin of cultivated plants. Leningrad: Institut Botanique Appliqué et d’Amélioration des Plantes.